UNEMBEDDED is a book and photo exhibit by four independent photojournalists, two women and two men, on the war in Iraq. 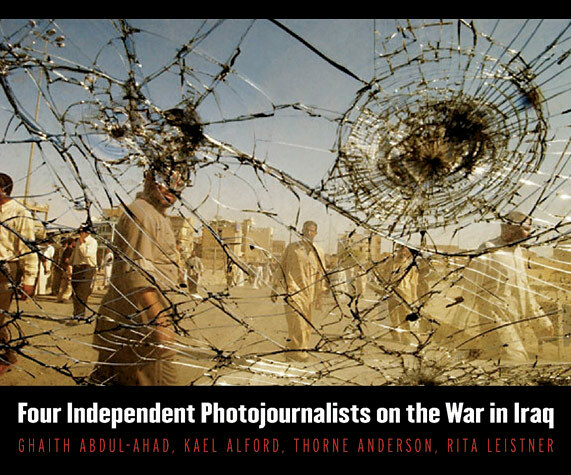 Kael Alford, Thorne Anderson, Ghaith Abdul-Ahad and Rita Leistner have produced a more in-depth, ground level visual portrayal of the war in Iraq than is available in most daily news reporting. Working over the course of years outside the confines of the U.S. military's official "embedding" program these photographers document issues often underrepresented in the mainstream media: the insurgency as seen from inside the separate resistance movements, civilians affected by the battles between the U.S. and insurgent forces, growing conservatism and fundamentalism and their effects on women, and the devastating effects of civilian casualties. The book and exhibit give audiences a nuanced view of the civil instability and increased violence in Iraq that has followed the US-led invasion in 2003. This body of work presents rare windows on the most recent front of the US "War on Terror,” in the land known as the cradle of civilization. The exhibit consists of 60 printed photos, and a soundtrack adapted from Andrew Berends film "The Blood of My Brother". The exhibit requires approximately 375 running feet of space and a CD player. The photographers are available to speak to public audiences and students. For more information about booking the exhibit contact Thorne Anderson: thornephoto[at]gmail.com. This site includes a schedule of the traveling exhibit and a gallery of a few of the more than 150 photographs from the book along with several short video clips. There is also a link for those who wish to purchase the book, invite the exhibition and films, reproduce some of the images or order prints. In the future we hope to open a community blog for those interested in Iraq war media coverage. Donations to expand the reach of this project are also accepted in the "Support the Traveling Exhibit" section.